Good printers are hard to come by. Greenerprinter is unique in that they have great products, helpful customer service and they really are serious about GREEN PRINTING practices. The school I work for in Berkeley wanted to find a local, conscientious and eco-friendly printing company, that was also affordable. We’re so glad we found Greenerprinter! They are so friendly and helpful, which can make a huge difference when you’re trying to communicate your vision to someone else. They’ve done many jobs for us, and I’m always pleased with the excellent quality. When we do have a rare glitch, this company will take the time to resolve it in a timely and fair manner, which I really appreciate. These guys are a trusted print source and I highly recommend them! 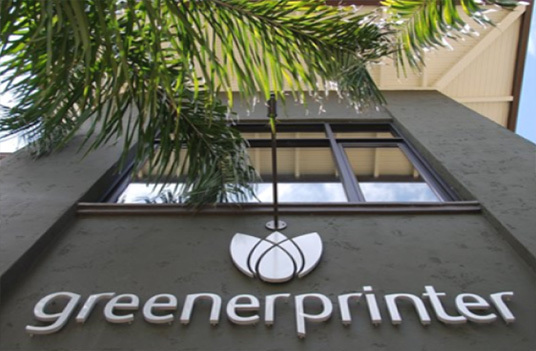 As their name suggests, GreenerPrinter is committed to finding environmentally friendly solutions to printing. Almost every process involved in their print production is eco-friendly, from the paper stock they use to the ink, and to the very process of production and packaging. Other Products Offered: Greeting Cards, Hang Tags, Bookmarks, Rack Cards, Newsletters, Calendars, Envelopes, Notepads, Wall Graphics, and Door Hangers. Other Services Offered: Panoramic Printing, Backlit Displays, CD/DVD Sleeves, Design Service, Retail Packaging, and Mailing Services.